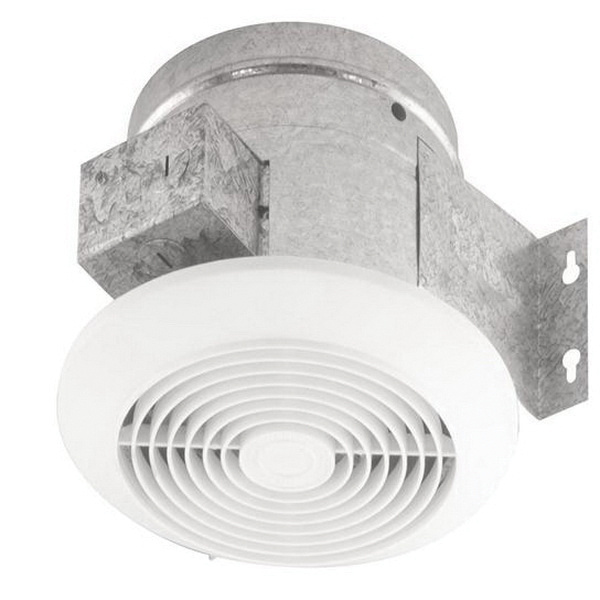 Nutone Ventilation fan in white color, has voltage rating of 120-Volts and current rating of 1-Amp. Galvanized steel housing has a dimension of 6-1/4-Inch Dia x 5-1/4-Inch. The ventilation fan rated at 2600 RPM, effectively delivers airflow of up to 60 CFM. The 8-Inch Dia round shaped polymeric grille in white color, supports spin-on mounting for quick installation. It requires 6-Inch vertical duct for installation. This ventilated fan has noise level of 4.5 Sones. It supports ceiling mounting. Ventilation fan is UL listed.